Ever since I started my blog, three years ago, my HAIR has probably received the most attention. 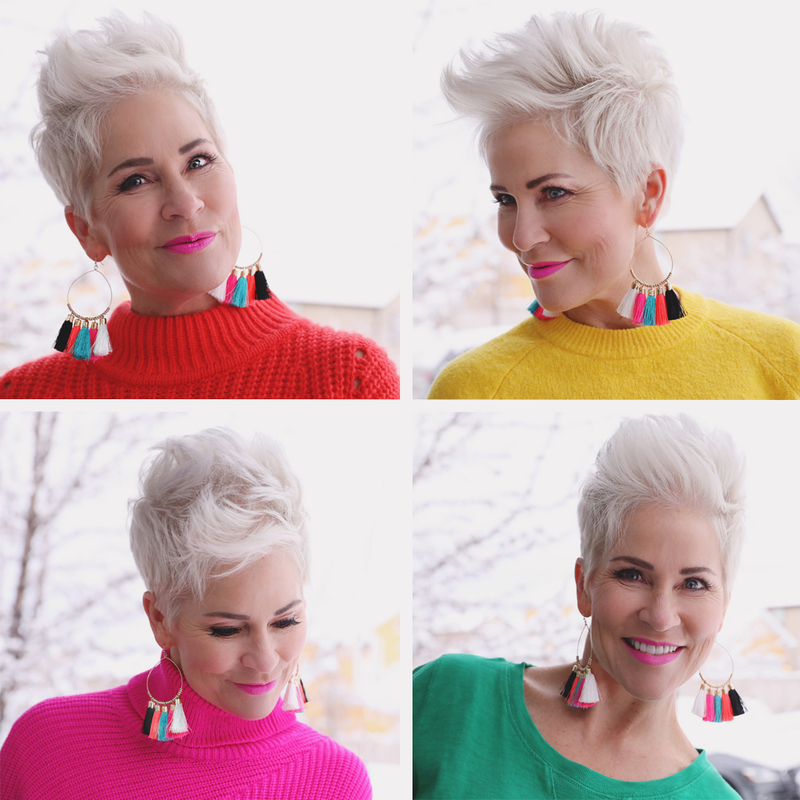 So this is another blog on my HAIR…..along with a little bit of NEON, BRIGHT, and BOLD color! And first a shoutout to my LANDIS AVEDA salon here in SLC. They have been so good to me in helping me look my best at all times!!! And I’m serious when I say AT ALL TIMES! My stylist Harley is SO GOOD at what she does. When you have someone that will take EXTRA time on YOUR hair because it has HER NAME on it…..well that’s a GREAT STYLIST! I love this about her! And just the whole feel at Landis Aveda, is SO RELAXING and PLEASANT! I have many requests to do a video on my hair and how I style it. I’ve tried and tried, but it never really turns out worthy enough to share. I really, really don’t spend more than 10 minutes on my hair. Most days I don’t even wash it. I just take what’s leftover from the previous day and rework it. I only wash it every four days or so. Washing your hair can be very drying. And my hair has much more texture in it after a couple of days. The products you choose to style your hair can MAKE ALL THE DIFFERENCE! In this blog here, I’ve listed my styling products….styling prep, shaping waxes, and spray. I do love this shining and smoothing product. I use it after I shampoo along with the styling prep. That’s pretty much it. Now on to these BRIGHT PUNCHY COLORS!!!!! They are definitely one of the hot trends for 2019, and I couldn’t be HAPPIER!!!! These are MY COLORS and look the best on me. VIBRANT is good! I talked about this on my Good Things Utah segment the other day. Remember if you want to try some, but are nervous about color….choose an accessory or lip color! It’s Friday…..almost through with January! Yay!!! Go and make it a great weekend and try some BRIGHT BOLD COLORS! You are the bomb and your hair is the cherry on the sundae! Absolutely ADORE your hair. So feisty and spunky. I wore mine short several years ago and the fam took a vote and asked me to grow it out. If mine looked like yours, though, I am pretty sure it would still be short. I don’t wash my hair more than 2x a week. But it is so thin and I am way overdue for a cut but haven’t been home long enough to go since Thanksgiving!! I would love to know some particulars about how she cuts your hair. I have been trying to duplicate your cut for some time and no one seems to get it right. Finding some one who does short hair well is difficult. I love love your hair, your style and your blog. You are an inspiration! I have a pixie and although I love it, I wish I had your texture so I could be more versatile with my hair. AND your style is amazing. I love your bold and bright colors and you dress so incredibly well. Thank you! Luv your hair. I too have a pixie & my biggest issue is dealing with hat hair in the winter any suggestions? This an interesting article. Thanks for sharing this amazing experience.